As the story goes, the Legares took their daughter’s body to the family crypt, remarking at how peaceful she looked, almost as if she was sleeping. Julia’s father laid her on the stone slab inside, and when they had said their goodbyes, the family closed the heavy doors, sealing the crypt’s keyhole with wax. Years later, Julia’s older brother was killed during the Civil War, and for the first time since Julia passed, the Legare family gathered again at the family crypt. As they turned the key and pulled open the heavy door, the entire family was horrified as Julia’s bones came tumbling out of the opening, her leathery skin still hanging from her gaping jaw. Claw marks covered both the door and the floor of the mausoleum and the bones of Julia’s fingertips were shattered, signs that pointed a frantic attempt to open the sealed door. Julia had not been dead, but merely in a coma. A “coma”? That’s a fine story for public consumption. But would a normal human, recovering from illness no less, be capable of leaving claw marks in the door and (presumably stone) floor? An alternative account might stress this family’s foresight in having realized their daughter might be in the process in undead conversion. They smartly decided to contain her body in a stone facility from which even a vampire could not escape. Of course, they could have just dismembered or cremated her body, but perhaps that seemed too gruesome or disrespectful. 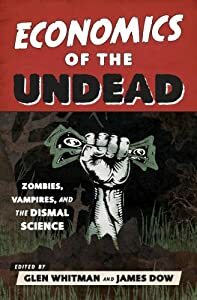 For more on how people might invest in the containment of family members expected to undergo a conversion to undead status, take a look at Eleanor Brown and Robert Prag’s chapter in Economics of the Undead, “Zombification Insurance” (excerpted here). By the way, this story is brought to us by Roadtrippers, which informs us that you can visit the tomb/containment facility in the present day. This entry was posted on Wednesday, August 13th, 2014 at 12:10 pm	and posted in Uncategorized. You can follow any responses to this entry through the RSS 2.0 feed.